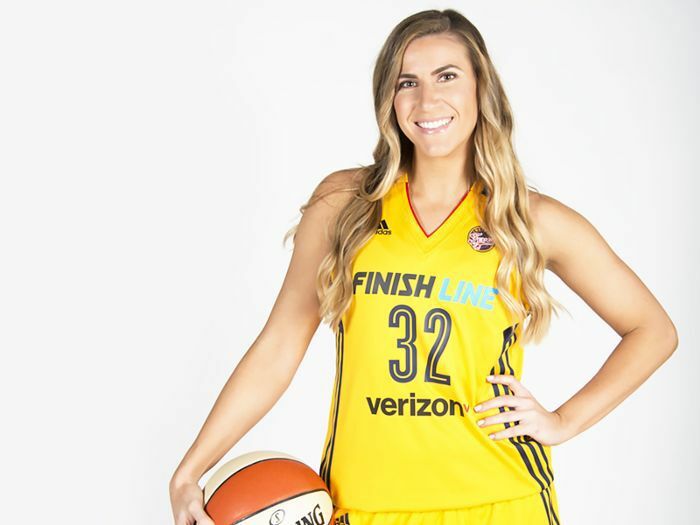 "The sky's the limit," former Indiana Fever coach Lin Dunn once said of the team's top draft pick Jeanette Pohlen-Mavunga, who was ninth overall in the 2011 WNBA Draft. In her rookie year, the Fever guard appeared in all 34 games and led the WNBA in three-point shooting percentage. Pohlen-Mavunga, formerly Pohlen, graduated from Stanford University in 2011—where she never lost a home game, went to four Final Fours, won four PAC-10 conference championships, four PAC-10 tournament championships, and was the PAC-10 Player of the Year in 2011. For the past six years, Pohlen-Mavunga has been playing for the Indiana Fever—adding the 2012 WNBA championship to her many accolades. In addition to being a busy WNBA champion, Pohlen-Mavunga is a self-described makeup, skincare, and hair product junkie. When we had the chance to catch up with her to discuss all things beauty, we learned about everything from professional athlete–approved facial cleansers to managing sweat to Japan's latest affordable beauty secret. Whether she's sinking three-pointers or out at dinner with friends, Pohlen-Mavunga's beauty game is always on point. Head below to see what WNBA champion Jeanette Pohlen-Mavunga has to say on her game day beauty routine, her favorite products (on and off the court), and the best beauty advice she's ever received. Doing my makeup is both fun and therapeutic for me. It kind of helps me to relax. BYRDIE: What is your game-day beauty routine? JEANETTE POHLEN-MAVUNGA: On game days, I try to make everything as simple as possible. I usually wash and dry my hair the night before so it's fresh and ready to go the next day. A little over an hour before I leave for the arena, I do my makeup. This usually consists of a full face of makeup (foundation, concealer, bronzer, blush, eye shadow, mascara, etc.) since I do not sweat on my face. Normally I will go out to grab a bite to eat after games, so it's kind of convenient that my makeup is already done, and all I need to do is a touch-up. BYRDIE: Post-game, what's your nighttime regimen? JPM: To take everything off before I go to bed, I always use a makeup-removing wipe. My current favorite is the Simple Micellar Makeup Remover Wipes ($6). They are great for sensitive skin, and I feel like they do a great job removing most of the makeup. After I use a wipe, I always use a cleanser. I have tried multiple cleansers, but I always seem to go back to Philosophy Purity Made Simple One-Step Facial Cleanser ($11). To me, it's just a great everyday cleanser for any type of skin. It's gentle, but it still gets rid of any excess makeup that the wipe did not remove. After my cleanser, I usually use the Mario Badescu Facial Spray With Aloe, Cucumber, and Green Tea ($7) followed by Kiehl's Ultra Facial Moisturizer ($20). I think it's a great daily moisturizer, and when I'm in a rush, it doubles as a great primer as well. BYRDIE: How do you make sure your skin stays clear when you're constantly working out? JPM: I do not sweat on my face or head—which is still such a mystery to me. I'm not complaining because it's great. One thing I make sure to do is to drink water all day, every day. When you are hydrated and feeling great, your skin will feel great. With all the sweating we do, it's so important to constantly drink water. There are so many other positives from drinking water, but keeping your skin clear and fresh is definitely one of them. Every player has their own way of doing things and their own personal look—that's what makes our league unique. BYRDIE: Especially during last year's Olympics, there was an issue with the media calling out female athletes for wearing makeup. As a professional athlete, could you weigh in on the matter and your decision to wear makeup on the court? JPM: When it comes to female athletes wearing makeup in their sport, I don't see anything wrong with it. For me personally, I feel my best when I feel like I look my best. So if that means wearing makeup and fixing my hair a certain way, then I will do it. Every player has their own way of doing things and their own personal look—that's what makes our league unique. At the end of the day, we all want to be successful whatever way we can. BYRDIE: Do you remember when you first got into beauty? JPM: I have always had an interest in beauty, even at a young age. My grandparents owned multiple beauty-supply stores in Southern California, and my dad and his siblings were all involved. Eventually, my dad broke away and started his own business, focusing more on selling and renting beauty salon and day spa equipment. I am a total makeup, skincare, and hair product junkie. I love to try new products and find my favorite ones. BYRDIE: What are your favorite beauty products? JPM: I go back and forth a lot between products, but some that are currently in my bathroom/vanity I have been loving are the Simple Micellar Makeup Removing Wipes, Drybar Detox Dry Shampoo ($23)—I have been through about 10 bottles of that stuff—Anastasia Brow Powder ($23)—I love it for a more natural look—the Tarte Shape Tape Concealer ($25), and my new holy-grail mascara is the L'Oreal Voluminous Lash Paradise Mascara ($10). BYRDIE: Even though your face doesn't sweat, are there certain products that are better for withstanding games? JPM: For games, I try to lean on the side of caution when I wear makeup. I always use a primer first because I think it helps the longevity of the makeup. I also use the waterproof version of my favorite mascara just in case my eyes water. I always make sure to set my makeup with powder as well. BYRDIE: How is your game-day makeup different from your everyday or your going-out makeup? JPM: It's kind of funny because other than game days and going out to dinner (or just a night out in general), I don't wear makeup too often. If I am doing something during the day and need to wear makeup, I will probably go for a tinted moisturizer like the Laura Mercier one, or I will do the It! Cosmetics CC Cream ($38). For a night out, I will try to do something more with my eye shadow or add a fun lip color. Whenever I do my makeup though, two things I always make sure I do are bronzer and my eyebrows. I feel like those two things can help so much no matter what kind of makeup look you're doing. BYRDIE: What is the best beauty advice you've ever received? JPM: The best beauty advice I ever received was less is more. I wasn't allowed to wear makeup until I was in high school unless it was a special occasion like a school dance in middle school. So when I was in eighth grade, one of my birthday gifts was a makeup lesson by a great makeup artist along with all the makeup she used on me. I loved how she did my makeup because you could tell I was wearing makeup, but it was so natural, and you could still tell it was me. BYRDIE: Are there any beauty tricks or products you've picked up during your time living in Japan over the past two years? JPM: I love it there. I plan on going back in November because my husband signed to play another year over there. They are all about skincare as well as nail designs. There are more kinds of sheet masks than I even knew existed. When I am over there next time, I'm hoping to try more beauty products in general. I usually get lash extensions when I am over there because it is so cheap compared to the U.S. It's cheaper to get a full set of lash extensions ($45) than a manicure with nail designs over there. For more fail-safe beauty tips from professional athletes, check out the one beauty product Olympians use pre-competition.